SPROUTS! In the 1940's Cornell University's Dr. Clive McCay referred to them this way: "A live vegetable that will grow in any climate, rival meat in nutritional value (and tomatoes in vitamin C), matures in three to five days, may be planted any day of the year, requires neither soil nor sunshine, can be eaten raw." Sprouting is an enjoyable activity that reduces energy usage, benefits the environment and results in improved health and well-being. It's finger-tip gardening at the point-of-consumption. It promotes self-sufficiency and independence. Are you missing out on the economic, environmental, nutritional and health benefits of sprouting? Would you like tax-free capital gains, less cooking, less trash to toss, more nutrient-dense fresh food in your diet and better health? Grow and eat sprouts - everyday. 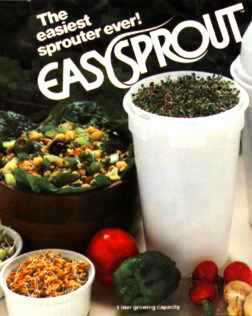 With EASY SPROUT™ and NO RINSE SPROUTING it's amazingly fast, efficient and convenient to produce, store and use practical quantities of sprouted seeds, beans, grains & nuts. You'll see.
. . . . . Order by PHONE 9-9 EST . . . . . .
1 -- RINSE 1-1/2 CUPS OF SEED IN STRAINER A COUPLE OF TIMES UNTIL CLEAN. 2 -- PUT SEEDS IN THE SPROUTER SET, AND FILL CANISTER WITH PURE WATER VERY WARM TO THE TOUCH TO WHICH YOU ADD 1/4th cup 3% FOOD GRADE HYDROGEN PEROXIDE TO SOAK FOR 9-12 HOURS. [Make a 3% dilution from pure 17.5% Food Grade H2O2 according to the dilution instructions.] COVER WITH THE LID WITH HOLES IN IT. 3 -- 9-12 HOURS LATER -- RINSE SEED WITH HEATED WATER UNTIL WATER RUNS CLEAR, AND THEN FILL WITH WATER WITH PEROXIDE AGAIN FOR A COUPLE OF MINUTES. DRAIN WATER OUT, THEN LET STRAINER SET STAND ON COUNTER FOR 12 MORE HOURS. 4 -- DURING 24 HOUR PERIOD, RINSE SPROUT SEEDS WITH WARM WATER with 1/4 CUP 3% PEROXIDE AT LEAST TWICE PER DAY TO KEEP MOIST AS DESCRIBED IN #3, AND STRAIN BEFORE RE-COVERING. 3 -- SPROUTS ARE READY TO SERVE AFTER 48-72 HOURS. 4 -- STORE SPROUTS IN REFRIGERATOR FOR UP TO 3 DAYS. 5 -- EACH DAY RINSE SPROUTS WITH A PINT OF COLD WATER TWICE PER DAY TO KEEP MOIST AND CLEAN which includes THE ADDED 3% dilution from pure 17.5% Food Grade H2O2 according to the dilution instructions AS IN #3.